Digital First Media’s financials — revealed here — show how the company has ridden its deep cuts to nearly $160 million in profits and the highest margins in the business. By Ken Doctor @kdoctor May 1, 2018, 10:55 a.m.
Is there any chance Alden Global Capital might change course? The majority owner of Digital First Media — publisher of The Mercury News, The Denver Post, the St. Paul Pioneer Press, 11 Southern California dailies, and 49 others from California to Michigan to New Jersey — has faced a rising tide of protest over the past month. Today we can reveal some key financial numbers from the very private company that shows just how successful Alden and DFM have been at milking profit out of the newspapers it is slashing to the bone. DFM reported a 17 percent operating margin — well above those of its peers — in its 2017 fiscal year, along with profits of almost $160 million. That’s the fruit of the repeated cutbacks that have left its own shrinking newsrooms in a state of rebellion. Now, as the company decides if and how to move against its publicly protesting top editors, Alden would seem to be at a crossroads. But as we explore below, it shows no particular sign of selling its embattled properties. Is continuing to milk its newspapers until they run dry still Alden’s likeliest course? It’s been quite a month for the chain. On April 6, The Denver Post’s editorial pages gave public voice to what had been an increasingly urgent (though usually more privately voiced) complaint: Alden’s strategy meant that the Post (and other DFM properties) would be nothing but “rotting bones” soon after the turn of the next decade. What has followed has been unprecedented. That six-page Post section juiced up the courage of editorial page editor Chuck Plunkett’s peers. In short order, voices of concern have gone public at DFM’s Southern California News Group, at its Bay Area News Group, at its cluster of Philadelphia suburban dailies and just down the road from the Post in Boulder, at the DFM-owned Daily Camera. It was in Boulder last week that DFM took its first personnel action around the protests. 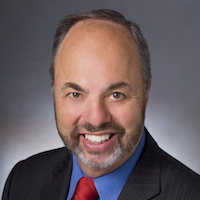 The company fired Daily Camera editorial page editor Dave Krieger. He had published his own in-your-face community plea on April 14. The Camera had rejected the piece for publication, so it appeared online on the Boulder Free Press blog instead. These are questions of the moment. While it’s easy to apply them to Alden alone, given its egregious behavior, they could well to be asked at Sinclair Broadcasting and at too many other “journalism” companies. Clearly, times have turned tenser for DFM’s chief operating officer Guy Gilmore and his bosses, Heath Freeman and Randy Smith at Alden Global Capital. While none would respond to inquiries, it’s becoming increasingly clear that public pressures have created headaches for them. Though Krieger is the first DFM employee to be terminated in the current controversies, the company wrestles — almost daily, I’m told by the numerous sources with whom I’ve spoken — with how to deal with the increasingly high-profile criticism. “Gilmore can rant and rave about who he wants to fire, but people have so far talked him down,” one source told me. As national media splashed into the story — The Washington Post, The New York Times, Times, Forbes, Esquire, Time, and public radio programs from coast to coast — the actions of Gilmore, Smith, and Freeman may be tempered by a new reality they face. DFM and Alden face a tough choice: crack down on its ever-vocal journalists and risk more public (and perhaps financial) damage — or wait to see if the rebellion dies down. Tempers are hot; actions remain unpredictable. The protesting editors remain in limbo — and need continuing public support. Among those questioning Alden’s deep staffing cuts action is Dean Singleton, who built the MediaNews Group chain that assembled most of what are today DFM’s larger newspapers. A still-towering figure in Denver civic life, Singleton sold his controlling stake in the company to Alden five years ago. He remains though on the Post’s editorial board. Over the years, he has said little about Alden’s cutthroat business strategies, but there may well be a line Alden could cross with him. Should Alden move to fire Plunkett or top editor Lee Ann Colacioppo, Singleton could well sever his relationship with the paper, an enterprise with which he’s been associated for 31 years. That would create a new problem Alden doesn’t need. The public shaming of Alden for its greed and disregard for newspapers’ historic community-serving missions hasn’t seemed to make an iota of difference in the company’s behavior. Alden could move to reinvest in its newsroom and products, or it could move — amid pleas of sell — to put its properties more actively on the market. It’s done neither — so far. But word leaking out of Digital First is that the financial impacts of the protests may drive the attention that public appeals themselves have not. The public protests have raised concerns among lenders, I’m told. 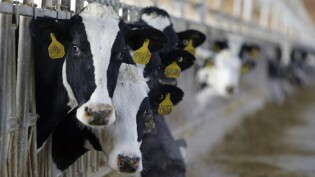 Those concerns may center on the continuing viability of DFM’s milk-it business model, or they may account for new risks to future performance. For instance, there’s word of two or more high-profile Denver Post advertisers talking about pulling their business from the paper, in protest of the last big layoff of 30 newsroom staffers. Then there’s the lawsuit of DFM minority owner Solus Alternative Asset Management, which provided new visibility into the company’s rob-from-the-papers, invest-into-an-allegedly-fraudulent-Mexican-real-estate-company activities. That suit must be dealt with in the months ahead; expect a big settlement. In addition, the company remains in the early stages of consolidating its far-flung pension obligations, and that work could also be complicated by the increasingly public questions about its future earnings and stability. At this reading, it’s unclear how much financial urgency the protests have caused, or where they may lead Alden/DFM management. They may a blip in the company’s wider profit-taking strategy — or they indicate new troubles ahead for the company. What is clear, though, is that Alden has transformed Digital First Media into a non-stop cash register. That’s a common sentiment I hear across the company. Certainly, publishers have long had to balance profit and their public mission. When even family-controlled newspaper chains like McClatchy, facing unprecedented revenue losses, continue to cut deeply into their news staffs, cuts have been a necessity industry-wide. But it is the depth of the DFM cuts that distinguishes the company from all its peers. And now we have new numbers to calculate the bleeding. How profitable is DFM? According to company financials provided by confidential sources, DFM made a profit of $159 million in its fiscal 2017, the 12 months that ended June 30 of last year. In total, it earned revenue of $939 million and had expenses of $780 million. That amounts to a 17 percent operating margin. What to make of those numbers? Without clarification from the company, which declined comment, it’s not possible to know what DFM puts into — or leaves out of — its expense numbers. If those expense numbers include items like capital expenditures, restructuring and asset impairment charges, and depreciation and amortization charges — as companies like Gannett do — then DFM’s margins are about double that of its peers. Even if some of those expenses are not included — for instance, to make the profit numbers look better in preparation for a sale — DFM’s margins would still outpace peers. That 17 percent margin ranks the highest among major chains. Four major publishers — the New York Times Co., Gannett, Tronc, and McClatchy — each post operating margins under 10 percent. Its Colorado properties — headed by The Denver Post but including 11 other papers that have received short shrift in the coverage of the protests — drive 22 percent of those profits, or $36 million. On its own, the group drives a 19 percent margin for DFM. That makes Colorado DFM’s second-largest profit driver. Leading the pack is the Bay Area News Group, headed by the Mercury News. Over the same time period, BANG cashed in $41 million in profit, spurred by a 21 percent margin. Most astounding within a decade of unending bad business news for newspaper publishers: In seven years, Alden has doubled its Bay Area News Group profit (including its main Silicon Valley properties, but not others on the region’s outskirts) from $20 million to $40 million. In 2011, its profit margin was 7 percent, one-third of what it is now. 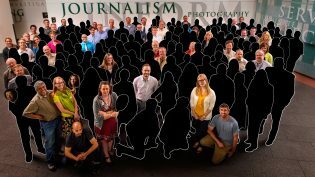 And in that time, the group has shed about 220 newsroom staffers, now down to about 160. The table below shows results per region. Also noteworthy is the only single-digit profit margin in the group: the Southern California News Group. That group, recently expanded with buys of both the Orange County Register and the Riverside Press-Enterprise, generates only an 8 percent margin, though still $23 million in profit. It, too, keeps making news with deep layoffs. The Pioneer Press, its staff slashed to fewer than 60, still produces $10 million in profit at a 13 percent margin. What’s the current DFM profit picture? Steady as she goes, say sources, as budgeting now begins for the fiscal year that starts July 1. In the current ad environment, Alden isn’t apparently asking for increased profits, but does intend to keep them at similar levels, no matter the level of staff and content cuts required. Back to the question: Will Alden sell? As the protests have rolled, I’ve tackled the issues that would come with Alden doing what the protestors want them to do: sell. As purely financial investors, it would make sense that if Alden could do better by selling than by holding and milking, it would be happy to. Indeed, the word persists among newspaper brokers: Alden says bring them any deal that offers 4×+ EBITDA and it will consider them. Has that standing word to the market changed? No, say brokers, it hasn’t. Alden — all must note — has shown no increased willingness to sell newspapers. While it has sold some papers in the Northeast in recent years — the New Haven Register and the Berkshire Eagle — both had a high tax basis, which maximized Alden’s gain. On the other hand, The Denver Post maintains a quite low basis, making any significant purchase price Alden could wangle for it highly taxable. 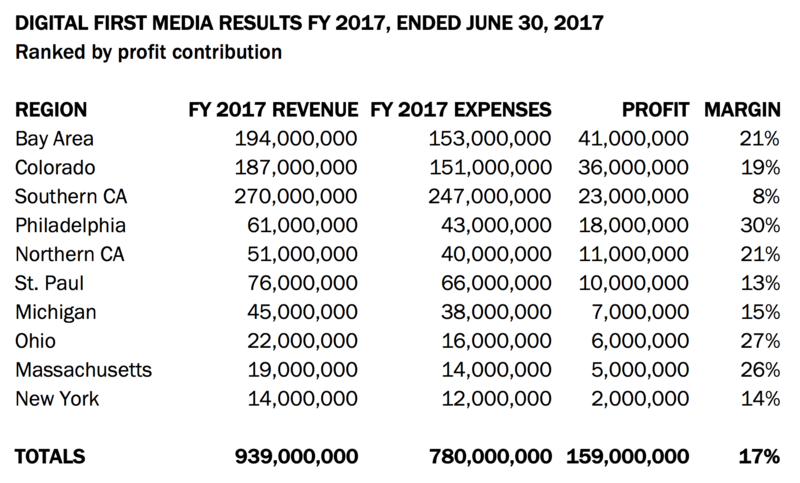 Further, The Denver Post has long over-contributed, based on its own about 20 percent contribution to company profits, to DFM’s corporate overhead. Remove the Post from the DFM portfolio and bad financial things happen to the larger company. On the other hand, continue to milk it — as about $28 million of DFM’s Colorado group profits derive from the Post — and Alden stands to make a lot more money by keeping and draining it than by selling it. Ironically, the Post — the paper at the center of these protests — may be the least likely big DFM property to be sold. Even as civic groups form to “save” the Post, Alden continues to reject — rudely, per standard Alden protocol — the buying inquiries from billionaire Colorado resident and Colorado Springs Gazette owner Philip Anschutz, who recently made a new attempt to buy the Post. Perhaps fear of these new financial impacts will change that calculus. It seems unlikely, but they could. We could see Alden lower its price target down into 3× territory, as prospects of these continuing profit levels get iffier and iffier. Another issue: For would-be buyers, the outsized profits make their own buy-and-reinvest scenarios tougher. No one seems likely to buy the Colorado properties for $144 million. With a demoralized Denver Post news staff of 60 and community protests, any buyer paying “full price” would have to calculate how much of that profit can be maintained for how long, and add in the costs of reinvestment. Even the Anschutzs of this world don’t want to overpay. In a sense, at this moment, both Alden and would-be buyers may be boxed into the dispiriting status quo — and it is the readers and communities of all these publications that remain the clear losers. Word of a gag order swept the web the end of last week, as an article at the DFM-owned Daily Freeman in Kingston, New York, tripped a wire. But gagging what’s said in the pages of DFM papers addresses only part of Alden’s problems. Outside those pages, protests have erupted amid calls for new “nonprofit” buyers. But other than Anschutz, no well-capitalized buyers have yet apparently emerged. Affluent Orange County, home of the pre-Great-Recession-high-flying Register, offers one window into such movement. Civic leaders there are trying to organize themselves, but I’m told action is “very preliminary.” Would-be buyers face a reality similar to what anyone thinking about buying The Denver Post does: an increasingly emaciated product. When DFM bought the Register (out of tangled bankruptcy and a fight with Tribune Publishing), the paper counted 180 in the newsroom. Two years later, only about one third — 60 or 70 — remain. Overall, DFM’s southern California staffing has been cut to about 235 from 400 just two years ago. At DFM’s suburban Philadelphia dailies, located in affluent markets, the daily concerns are both big picture and more mundane: rats, mildew, falling ceilings. “Just today, we got a call from our Pottstown paper that they were told to work at home today” as the company again tried to fix a persistent mildew problem, local union representative Bill Ross told me Monday. That Pottstown Mercury? It’s one of those half-dozen DFM properties that produced $18 million for Alden last year, even as it absorbed more newsroom cuts. Those Philly suburbans — rats, mildew and all — lead the whole company in profit margin, at a whopping 30 percent. 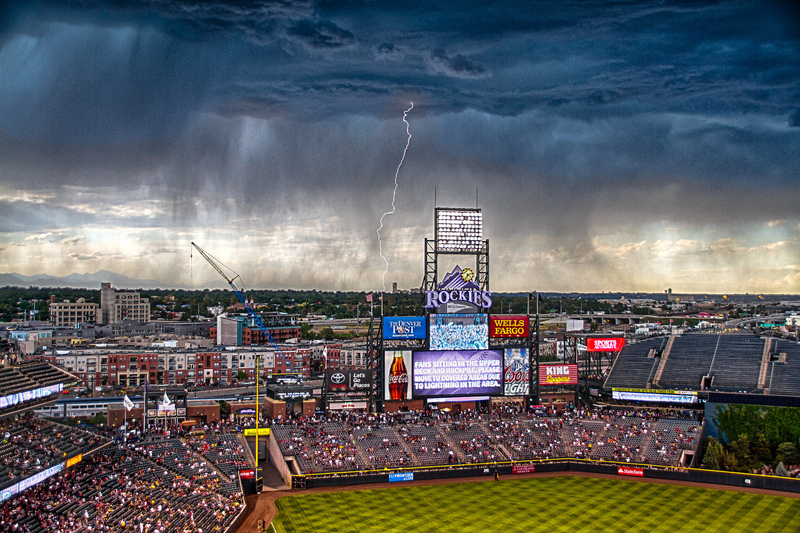 Photo of lightning striking near a Colorado Rockies game in 2013 by Sam Cox used under a Creative Commons license. POSTED May 1, 2018, 10:55 a.m. Doctor, Ken. "Newsonomics: Alden Global Capital is making so much money wrecking local journalism it might not want to stop anytime soon." Nieman Journalism Lab. Nieman Foundation for Journalism at Harvard, 1 May. 2018. Web. 24 Apr. 2019. Doctor, Ken. 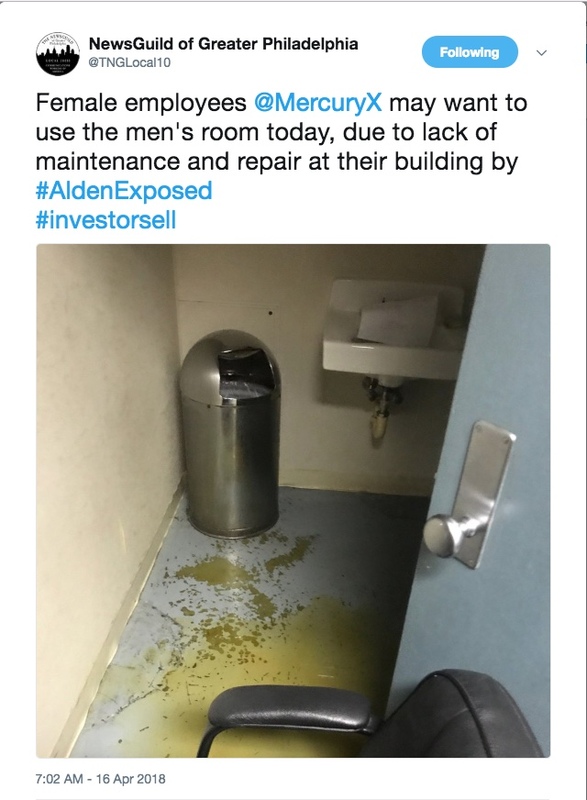 "Newsonomics: Alden Global Capital is making so much money wrecking local journalism it might not want to stop anytime soon." Nieman Journalism Lab. Last modified May 1, 2018. Accessed April 24, 2019. https://www.niemanlab.org/2018/05/newsonomics-alden-global-capital-is-making-so-much-money-wrecking-local-journalism-it-might-not-want-to-stop-anytime-soon/.